Huh? Punishment for Taking Out A Loan You Couldn't Afford is... You Don't Have To Pay the Loan Back? I really was not going to blog this week but this article exceeded by fury threshold, which is pretty hard to do nowadays. So in fact, incredibly, the creditors' very innocence is used as part of the proof that the debt was illegal, and thus that creditors should be expropriated. This is they type of thing that occurs in banana republics. No honest nation with a strong rule of law operates this way. And what is to prevent other distressed government bodies with limited ethics (e.g. the State of Illinois) from carefully borrowing money in a way that is subtly illegal and then repudiate it a few years later? 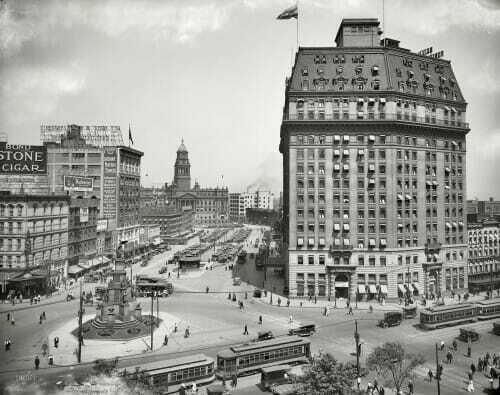 Via Shorpy, Cadillac Square in 1916 Detroit. A substantially more prosperous city than today.